I have always wanted to get some photos of me with my littles. It helps that a lovely local photographer was doing mini sessions in a lavender field up Island a bit. 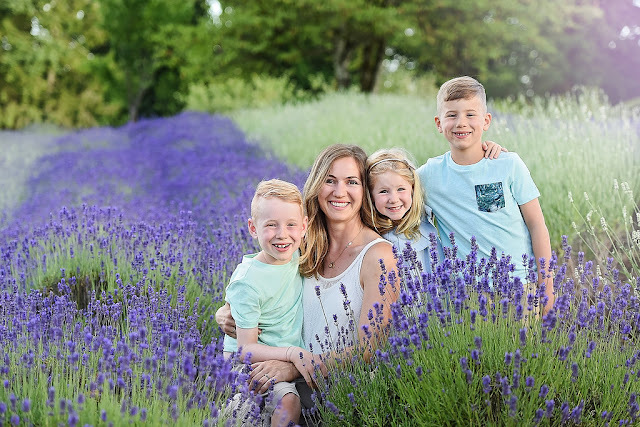 We headed up to Damali Lavender Farm one Sunday evening to have some photos taken and the lighting was so lovely! Even thought it was a mommy & me session we were able to sneak Jeff in for a pic too :) So thankful for these sweet pics! I'm a momma of two beautiful boys and a sweet little girl and a wife to an awesome husband. I'm an elementary school teacher and stay a home mom enjoying life on Vancouver Island. I dream of spending time as a family in France where we can soak up the culture and language.